An atheist was walking through the woods. What majestic trees! What powerful rivers! What beautiful animals! He said to himself. As he was walking alongside the river, he heard a rustling in the bushes behind him. He turned to look. He saw a 7-foot grizzly bear charging towards him. He ran as fast as he could up the path. He looked over his shoulder and saw that the bear was closing in on him. He looked over his shoulder again, and the bear was even closer. He tripped and fell on the ground. He rolled over to pick himself up but saw that the bear was right on top of him, reaching for him with his left paw and raising his right paw to strike him. 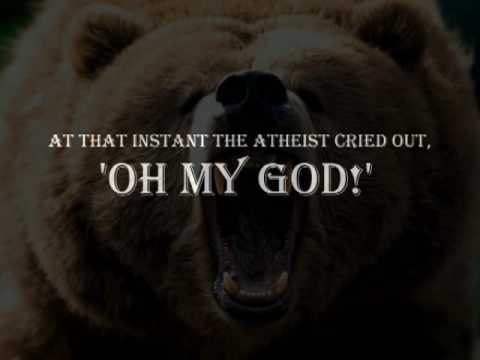 At that instant the Atheist cried out, ‘Oh my God!’.